Posted by Argos. November 27th 2015. The change of season into autumn means pet owners have to be on their guard to make sure their animal stays safe. For dog owners, one of the main things to consider is that the nights are drawing in and you will have to change your walking habits. 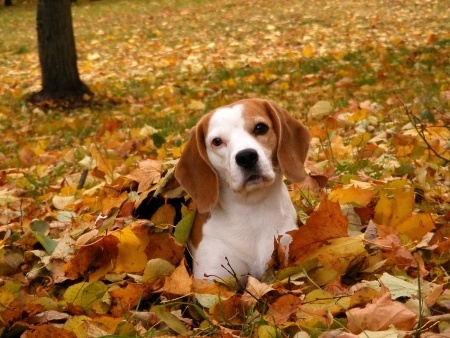 But there are other autumn aspects to bear in mind when it comes to pet health. 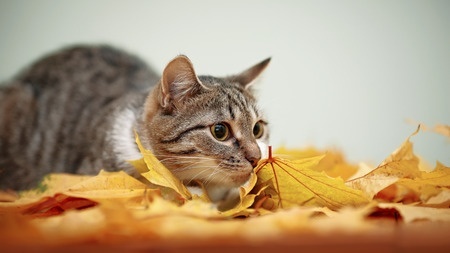 The changing colours of leaves are one of the pleasures of autumn but when they are on the ground, they can cause problems for pets. Damp leaves, particularly when piled up, are a favourite haven for bacteria and mould. If your pet ingests such micro-organisms, it could lead to digestive problems such as a loss of appetite or even vomiting and diarrhoea. If you choose to burn leaves, make sure your pet is well out of the way as some plant-based oils can irritate your pet’s nose and eyes. There are a number of common plants that flower during autumn that can cause problems for your pets. Chrysanthemums, for example, are a welcome addition to any garden and a sight to behold in the later months of the year but you should keep your pets away from their stems or leaves. The leaves of a chrysanthemum can be toxic to dogs and cats, which could result in skin irritation, increased levels of saliva, loss of balance, vomiting and diarrhoea. Other popular plants that have a similar affect include autumn crocus and clematis. Mushrooms also tend to sprout up more during autumn. Fortunately, most that grow in our gardens are non-toxic but it is best to discourage your pets from eating them as some can be toxic and eating those can be very harmful to your animal. A fall in temperatures can encourage mice and rats to search for shelter, so you might be tempted to use poison to deter vermin. However, you should also bear in mind that these poisons will also be dangerous to your dog or cat. Symptoms can include lethargy, pale gums, blood discharge in faeces. If you suspect your dog or cat has eaten mouse or rat poison, contact your vet immediately.